In this article, I have hand-picked the best free multipurpose WordPress themes for your project. Why multipurpose WordPress themes? Because the single website is suitable for all kinds of projects like corporate, business, eCommerce, personal blog, music and so on. All other websites, it provides the essential features and functionalities to create a healthy website. Multipurpose WordPress themes are very versatile and flexible, also uplifts your business like any other niche-focused website. If you are planning to start an online business venture, you have landed in the right place, you may check our list of best free multipurpose WordPress themes. All the below mentioned themes are simple yet powerful at the same time. They are very modern and has a very attractive interface that takes your website into the next level. No doubt, they have an ability to create a healthy and fully functioning website. Let’s check out the free multipurpose WordPress theme for your online business venture. Mediciti Lite is a simple yet powerful multipurpose WordPress theme. It is suitable for all kinds of medical projects. Be it hospitals, health centers, lab, or ambulance service, surgeon, veterinary, the theme flawlessly handles them all. This WordPress theme offers call to action section and call out option. You can easily customize the home page with easy to use set of theme options. No need to write a single line of coding. Further, it has beautifully created demo website along with one click demo importer feature. Don’t have time to start from scratch, simply import demo data and your site will hit the ground running. Ace Corporate is another free multipurpose WordPress theme for business. Apart from that, it is also suitable for creative agency, portfolio, blogging and so on. Even though Ace Corporate is a free theme, it contains an advanced admin panel and premium like features. Built-in with the Bootstrap framework, no matter how you create your site’s design, it flawlessly adapts any viewing environment. Similarly, this theme includes Testimonial Sections, Page Layout, Blog Layout, Customizable Banner Slider and much more. Multipurpose Magazine is trendy and modern free multipurpose WordPress theme. The theme is suitable for all kinds of magazine websites for online magazines, newspapers, editors, journalists, publishing units, bloggers/. Similarly, it is also perfect for launching informative sites, educational websites, content writers, and other similar websites. With the deep integration of the WooCommerce plugin, you can also initiate an online magazine website. This multipurpose WordPress theme comes with the advanced features. It has Banner, Slider, social media integration, Bootstrap, translation ready facility, template pages, and so on. Multipurpose eCommerce is elegant and well polished free multipurpose WordPress theme for fashion, jewelry, bookstore, business, agencies, and several other projects. Built for any level of users, it has user-friendly personalization options that let you create a site on your own; without writing a single line of coding. You can change section, shortcodes, emphasize banner image and so on. Fully integrated with Social Media, target your audience through social media channels and increase the scalability of your business. Utilize full-width images, Call to action buttons, testimonial section, and other features to make your site professional. November Zone is a simple yet powerful multipurpose WordPress theme for any type of business. The theme is fully responsive and compatible with all devices, so you don’t have any problem designing minute details. Similarly, it comes with Elementor Page Builder plugin, which means you can easily create a layout with its drag and drop function. Furthermore, built in with WP Customizer, you can see the changes happening live. 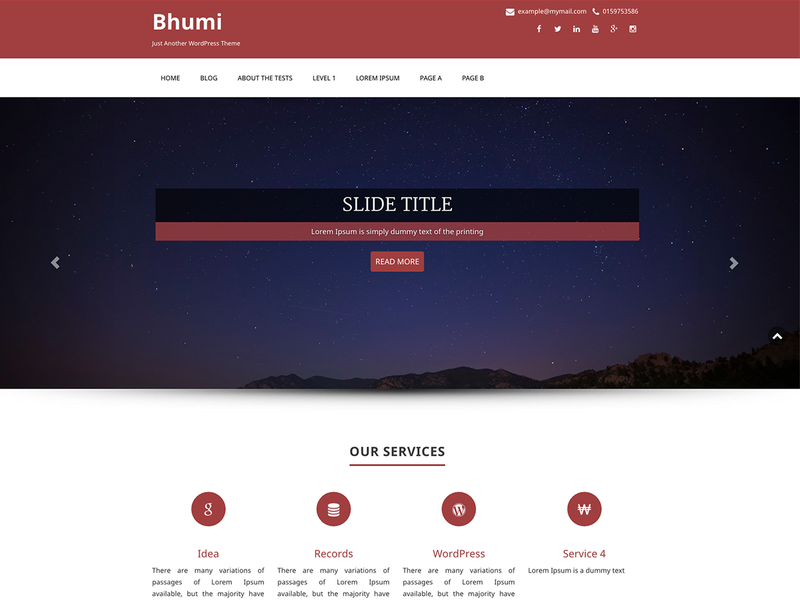 Bhumi lite is superfine free multipurpose WordPress theme that is perfect for your business, eCommerce, portfolio or any kind of projects. This theme flawlessly integrates with WooCommere plugin, which lets you initiate an online store with a short span of time. Built in with extra care and attention, Bhumi Lite is ultra retina friendly and adapts any viewing environment. Tons of customizer options, unlimited possibilities, Bootstrap framework, make this theme a perfect choice for your next project. Another popular free multipurpose WordPress theme that is suitable for all kinds of projects. Built any website with this theme, Business Insights profoundly handles them all. Eventhough this theme is free, it contains powerful features and options; that allows you to easily customize the theme without writing a single line of coding. Business Insights includes features like theme options, responsive layout, footer widgets, custom widgets and so on. Envo Multipurpose is free responsive multipurpose WordPress theme that is perfect for creating any type of websites like corporate, blogging, business, portfolio and so on. This theme has amazing multipurpose functionality that is compatible with most prominent premium plugins. Similarly, it is compatible with Elementor, KingComposer, Beaver Builder, SiteOrigin, Divi, Brizy, Visual Composer, WooCommerce, Yoast, Contact Form 7, so on. Multipurpose Blog is elegant and modern free multipurpose WordPress theme, compatible with WooCommerce plugin. it is perfect for creating various purposes like eCommerce, personal blog, corporate business, fashion, lifestyle, magazine etc. In addition to that, Multipurpose Blog has slider with a banner along with Call to Action Button (CTA) to grab the attention of the visitors It comes with a powerful theme options panel from which you can easily customize the theme and craft a website as you desire. Freddo is minimal WooCommerce ready free multipurpose WordPress theme. It contains tons of advanced features that can be used for various purposes. Further, it is compatible with WPML and Page Builder plugins. Similarly, Freddo comprises one click demo importer feature to import sections in the home page. The theme is fully responsive, elegant, and comes with plenty of customization options. It is one-page theme comes with features like 2 sidebars, unlimited, footer widget, and custom logo. Integrated with the WooCommerce and WPML plugin, Enigma is one of the most popular best free multipurpose WordPress themes that has earned 20,000+ active installation. Be it small projects or large projects, this theme handles them all; as it comes with arrays of crucial powerful features, theme options and extensions. It is fully responsive and works perfectly in any kind of screen sizes and resolution. Probably the best free multipurpose theme that will for creating any kind of projects. Savona is perfect for blog, travel, online store, food, lifestyle and so on. Integrated with WooCommerce Plugin, it allows you to initiate an eCommerce website an sell your merchandise without writing a single line of coding. Savona has an extension customization admin panel, that allows you to set a site according to your desire. All the above-mentioned themes are the best free multipurpose WordPress themes, that will surely take your project into the next level. Select any one of them, it will not disappoint you. If you come across any best free multipurpose WordPress themes, feel free to share it on our comment section. We will update this article as soon as we get a handful number of best free multipurpose WordPress themes. Nice themes collection thanks for sharing.